Content by Tony Macklin. Originally published on December 26, 2014 @ tonymacklin.net. 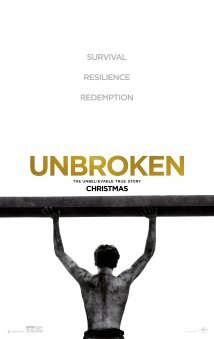 Released in the U.S. on December 25, Unbroken is a Jolie, Jolie Christmas. Director Angelina Jolie has made a film that is part genus, part adventure, and part religious tract. Jolie tries to walk in the footsteps of fisherman Mel Gibson. Unbroken is sometimes facile, and - at crucial times - almost parody. Unbroken has perhaps the most labored Christ figure ever in a film. When a sadistic, probably psychotic, Japanese POW camp commander (Takamasa Ishihara - stage name Mijavi) falls on his knees before our ersatz hero, it is a bit much. No, it's an awful lot much. For a while it seemed as though the POW camp was going to be set in a stable. At the beginning, words on the screen tell us it's a "true story." Angelina, please define "true." The source for the film is the story of Louie Zamperini (Jack O'Connell) - captured in a book by Laura Hillenbrand. Zamperini took part in the Olympics of 1936, was adrift in a raft on the Pacific ocean for 47 days after a plane crash in WWII, and spent a brutal period in a POW camp. Unbroken has a synthetic quality to it. In one crucial scene, a battalion-sized group of men lines up to one-at-a-time punch Louie in the face. It's an almost endless bashing. In reality, anyone who took that beating would have a face of pulp. But it seems Louie didn't even lose one tooth, much less have any broken cheekbones. Angelina awkwardly pulls the punches. In a way three Magi - actually five writers - have concocted three different films in one. Sometimes gold, frankincense, and myrrh don't mix. The beginning and ending of Unbroken are generic. Louie's childhood as a reprobate is conventional, and the ending is a yawn. It has a crowd applauding Louie. But the screenplay does have words to live by. Louie repeats his brother's dictum, "If you can take it, you can make it." Were there infomercials back then? His brother also tells him that, "A moment of pain is worth a lifetime of glory." Huh? I'll take the glory. The best element of Unbroken is the cinematography of Roger Deakins. Deakins, as always, uses light very effectively. The air battle scene is potent. The music by Alexandre Desplat - not surprisingly - is syrupy. A tacked-on comment in words on the screen at the end of the film are inchoate. They say Louie turned to God. What is not included is the salient information that Louie underwent "conversion" at a Billy Graham crusade. The next showing of Unbroken is scheduled for the revival tent.